For corrosive environment and fiuids, can be used on equipments with vibrations and high dynamic pressure loads, no formation of condensation. Such as food processing and petrochemical equipments. 3. 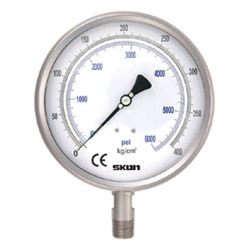 Pressure range: -1/0 to -1/+20 kg/cm² (bar), 0/1 to 0/2000 kg/cm² (bar). 4. Operating temperature: working temperature: 100℃, ambient: -20℃ ～60℃. 6. Connector size: 22mm 1/2’’, pt, npt, pf, bsp. 9. Dial: aluminium alloy in white, graduations & figures in black on white background . 14. Window: laminated safety glass. 15. Order options: flange, filling fluids, red mark pointer.